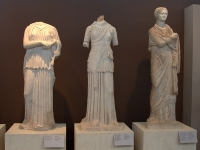 The Thessaloniki Archaeological Museum is regarded as one of the finest museums in Europe; it is near the famous White Tower and opposite the city's international fairgrounds. The museum houses a huge collection including the incredible treasures from the tomb of Alexander the Great's father, Phillip of Macedon, which was discovered at Vergina in 1977. Another treasured artefact is the 3rd century BC Derveni papyrus, the only intact ancient papyrus found in Greece, which was discovered in the tombs of Derveni. Other rooms in the museum contain exhibits depicting the history of the city from prehistoric days through to the Roman period, including spectacular mosaics and some exquisite, delicate Hellenistic glass. The museum will occupy visitors for a few hours if they are interested in history and archaeology and it is a well-organised and impressively laid out collection. Thessaloniki has a captivating history and it rewards investigation.